Whether designing new spaces or re-designing existing ones, we search for ways to maximize ambient, natural light and create open interior junctions. For this particular project, architect Cindy Chan reformatted the secondary entrance of this home by removing the walls and door that enclosed the service stair leading from kitchen to driveway. 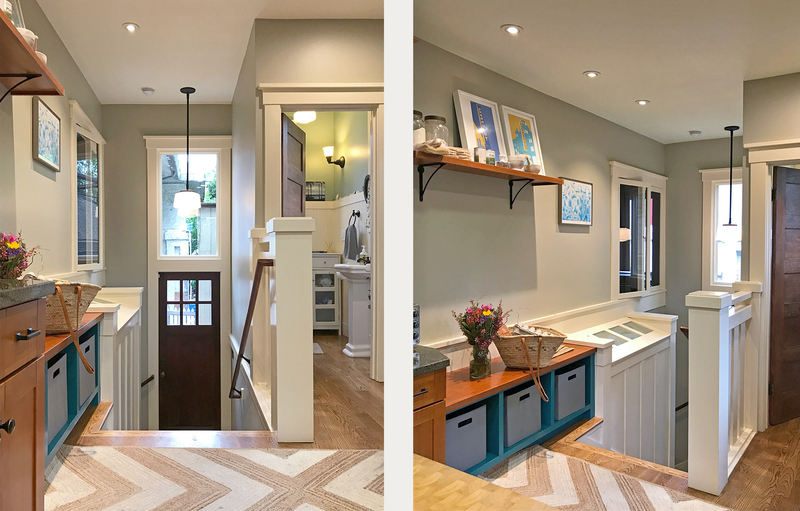 At the upper landing of the stair, she created a built-in bench with cubbies to serve as a mudroom/ storage area. At the lower landing where the exterior door exits to the driveway, she added a large transom window, creating a two-story view with an extra boost of daylight. An interior window set into the stairway wall connects to an adjacent office, perpetuating the circulation of light from the outside. 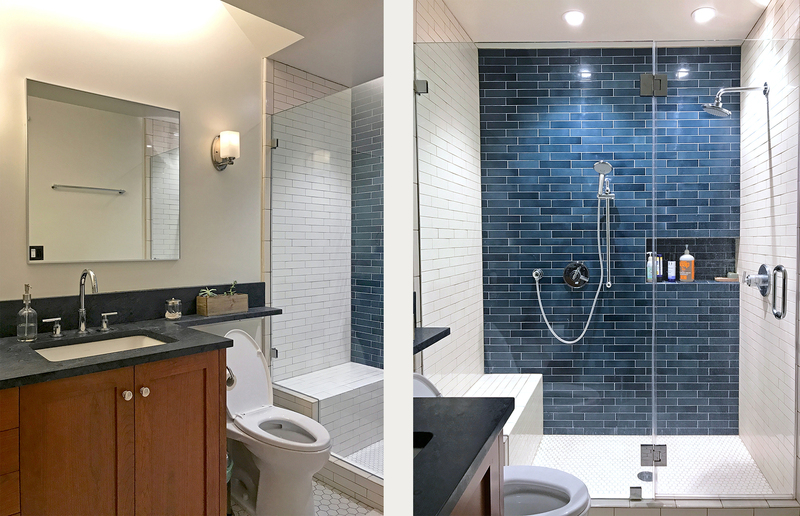 A new lower floor bathroom is lit by a strip of interior skylights, set under the transom and office windows, which filter natural light into an otherwise windowless space. The exterior of the skylight shaft is disguised as a wood paneled wall along the stair. 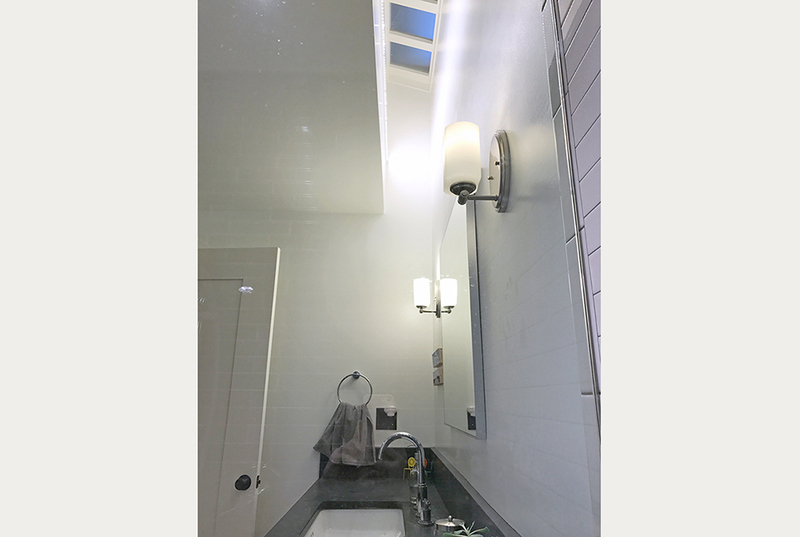 LED strip lights are set into the skylight well in the bathroom, which give the effect of natural light during hours when the house is in shadow. The triangulation of transom, interior window and skylight allow for the proliferation of natural light, even in areas not directly exposed to it. above: the interior skylight channels ambient light from the floor above, and LED strip lights brighten the interior, creating the look and feel of natural lighting.